In what was Germany’s first win over Italy since 1995, Joachim Löw’s side showed clear improvement compared to the loss they suffered against England on Saturday. Germany again didn’t keep a clean sheet, but this time dominated their opponent fairly easily. Both teams deployed similar 5-2-3 systems from the outset. Germany’s back line featured Antonio Rüdiger, Shkodran Mustafi and Mats Hummels in the middle, while Sebastian Rudy and Jonas Hector bombed up and down the flanks. Italy’s head coach Antonio Conte fielded Francesco Acerbi and Matteo Darmian alongside Leonardo Bonucci in central defence, with Emanuele Giaccherini and Alessandro Florenzi as wing-backs. Having shown better offensive movement than Graziano Pellè in the friendly against Spain last Thursday, Simone Zaza started upfront. For the first few minutes of the match, the Juventus striker only had defensive duties, as Germany saw more of the ball. Italy defended in a 5-4-1 shape, with Zaza pressing high up the pitch, being clearly outnumbered. The rest of the Italian team sat back and stayed compact. Their defensive plan, however, played into the opponents’ hands. As Conte identified right-wing-back Rudy as the weakest point in Germany’s line-up, his team usually tried to guide Germany’s build-up play towards Rudy’s side in order to dispossess the hosts quickly. Unfortunately for the Squadra Azzurra, Mesut Özil, Thomas Müller and Rudy created small triangles on the right side, so they could outplay Italy’s two players near the touchline. Löw used Özil in an unfamiliar role. The Arsenal playmaker was mostly positioned next to Toni Kroos in central midfield. He looked uncomfortable at first, especially when Kroos advanced and Özil had to play a holding role, but later in the first half, the 27-year-old became very essential to Germany’s attacking play. Germany didn’t struggle to get past the two defensive midfielders, Thiago Motta and Riccardo Montolivo, because Italy often left the half-spaces in front of the back line open. Yet, it seemed to be almost impossible to get in behind the Italian back five when moving the ball across the middle – especially in rather static situations. Consequently, Löw’s team intended to create quick transition attacks after winning the ball and to exploit their advantage on the right side. Germany scored two goals in the first half, both initiated on that flank. In the 24th minute, Rudy played an intelligent backwards pass to Özil, who then found Müller near the touchline with a precise lob pass. Bonucci deflected Müller’s low cross into the path of Kroos. The Real Madrid midfielder again scored the opening goal from distance, as he did against England. Wearing the captain’s armband for the first time in his career, Müller was also involved in the second goal of the night, when his chipped pass found Mario Götze’s head. A moment prior to that, Müller pretended to play the ball to Rudy on the wing. His feint led to Acerbi staying passive a few yards away from the German captain, so the Italian centre-back eventually couldn’t prevent Müller’s assist. As for Götze, his performance should be a confidence boost for him after disappointing weeks. With an in-form Götze, Löw has two options for the centre-forward role. Mario Gómez is an out-and-out striker whose numbers in terms of ‘end product’ at Besiktas have recently been impressive. Götze, on the other side, moves fluidly through the last third, linking up with the midfielders. In the first few minutes of the game, he kept his position in the middle, but started to roam through the zones shortly after. In the fifth minute, Götze appeared on the left wing for the first time and, from then on, he was omnipresent. He not only threatened the likes of Bonucci and Darmian with his agility and ability to dribble in tight spaces, but also drifted wide to play one-twos and open up space in the middle. 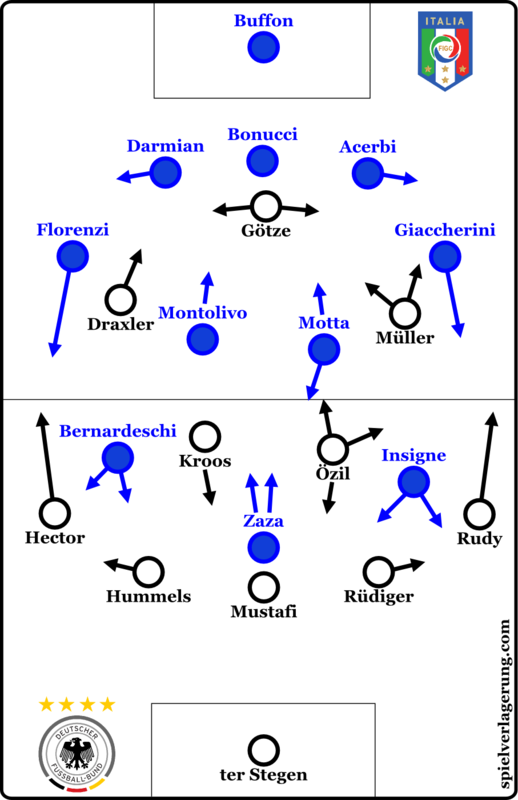 Özil, Müller and Götze had prominent roles in Germany’s build-up play, as Löw’s team used a flexible version of the 5-2-3 system. Italy, however, struggled to move the ball forward, because their formation appeared to be too rigid. At the beginning of the match, both attacking wingers, Lorenzo Insigne and Federico Bernardeschi, floated around on the periphery. Therefore, Italy had two players hugging the touchline on each side, while lacking presence in the half-spaces. Bonucci played a few vertical passes to Zaza, who dropped back and tried to draw out Mustafi. But the centre-forward needed receivers for his layoff-passes. And even when Insigne drifted inside to pick up the ball, he had to keep the ball for a moment before one of the wing-backs was open and Insigne could launch a crossfield pass. After the opening stages, Italy began to vary their approach without possession. Insigne usually was the first attacking winger who pushed up tight to the centre-back on his side, signalling his team-mates to move forward and close down the German players. Through this pressure, Italy caused some problems and took command for a short while. In order to outnumber Italy’s first block, the German defenders often played the ball back to Marc-Andre ter Stegen. The Barcelona goalkeeper looked uncomfortable with the ball at his feet, though. When Zaza pressured ter Stegen and blocked the passing lane towards the German defender he left open, some of the goalkeeper’s long balls went astray or Italy intercepted them instantly. At the other end of the pitch, Germany frequently used a high press as well. Italy were 3 v 3 at the back, with both Darmian and Acerbi drifting wide. Therefore, the opposing wingers could pressure them rushing from inside to out and blocking the diagonal passing paths towards Italy’s defensive midfielders. Conte didn’t adjust his tactics during the half-time break. And Germany ran away with the game after the interval. Although Italy had some success with their high press, their defence seemed entirely disorganised on various occasions. In the 59th minute, Julian Draxler and Götze set up Jonas Hector’s first goal for the national team. Draxler got past a few Italian players before sliding the ball towards Götze to play a one-two. Bonucci left his position and tried to stop Götze’s back-heel flick, but he dropped to the turf with an apparent muscle injury. Draxler broke free, raced in on goal and fed across for left-wing-back Hector to score Germany’s third. Özil added a fourth from the penalty spot in the 75th minute after Buffon brought down Rudy in the area. This time the other German wing-back made a long run upfield to get involved in the final third. Eight minutes later, Italy found a consolation goal through substitute Stephan El Shaarawy, whose effort took a big deflection off Rüdiger and looped into the net. The scoreline suggests Germany battered Italy. In truth, Löw’s side didn’t have a huge amount of goal scoring opportunities throughout the 90 minutes, but once they bypassed Italy’s first block and moved the ball down the wings, the quality of the shots they created was relatively high. Six out of nine shots went on target. These mistakes should not be expected from Italy Defensive squad… They should have made a fight with Germany!!! Cause Germany is too aggressive by defence.